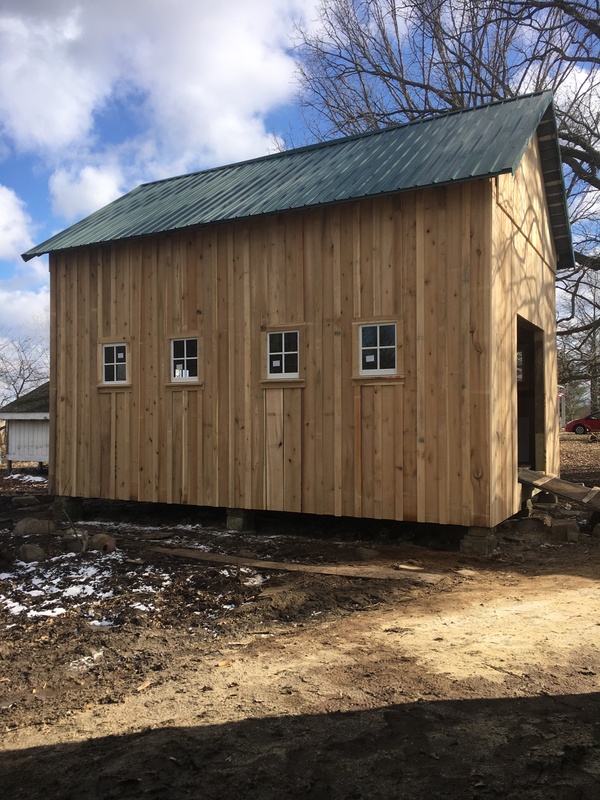 This is an old granary we just restored. It was one of many historic restoration jobs that we have done over the years. They often involve replacing of repairing the foundation. A building is only as good as it’s foundation. The sill or part of the structure that sits directly on the foundation is often in need of replacement or repair. This can be done more easily at this time. Once the building sets firmly on a good foundation the rest of the historic restoration can proceed. The main frame is usually next in line. It is important to thoroughly inspect all parts of the frame from the sill to the peak. Whether it is of timber frame or stud frame construction we are capable of doing whatever is needed of restoration or repair of the frame. Now that the frame is in good order siding and roofing are next. In the case of this structure, the old siding was too far gone so it was removed. New Yellow Poplar siding was milled, air dried and installed in much the same way it would have been originally. Often the roofs are in good condition or need minor repairs. For a structure to be worthy of historic restoration it has to be restorable! Usually, this means the roof has been in okay shape. If repairs or replacement do need to take place that would be done now as well. So now the exterior is in good shape so now on to the interior. This can be from simply a good cleaning to an all-out complete restoration. Sometimes the use of the building is changed for instance a barn becoming a house of an old mill becoming offices. What are some of the things to consider when looking into a historic preservation? Of course, the overall structural integrity of the building must be assessed. Unfortunately, some structures are just too far gone to restore. This, however, is actually a matter of the budget. In fact, any building can be restored but the cost is on occasion just too great to warrant the work. We can assist you with a budget estimate to make this evaluation. Once that decision to proceed has been made we can make a detailed estimate for construction. Whatever your needs may be, feel free to contact us. We look forward to serving you. ← Adding a basement to an existing house.